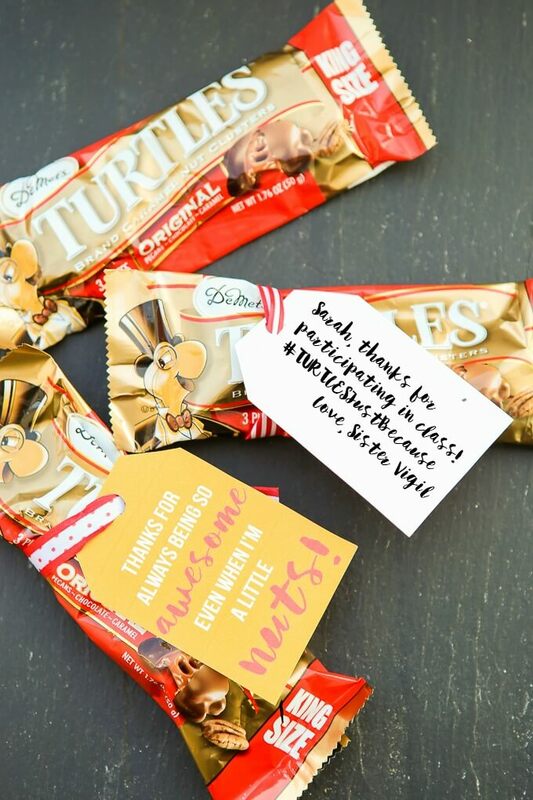 This is a sponsored post written by me on behalf of DeMet’s TURTLES®. All opinions are 100% mine. 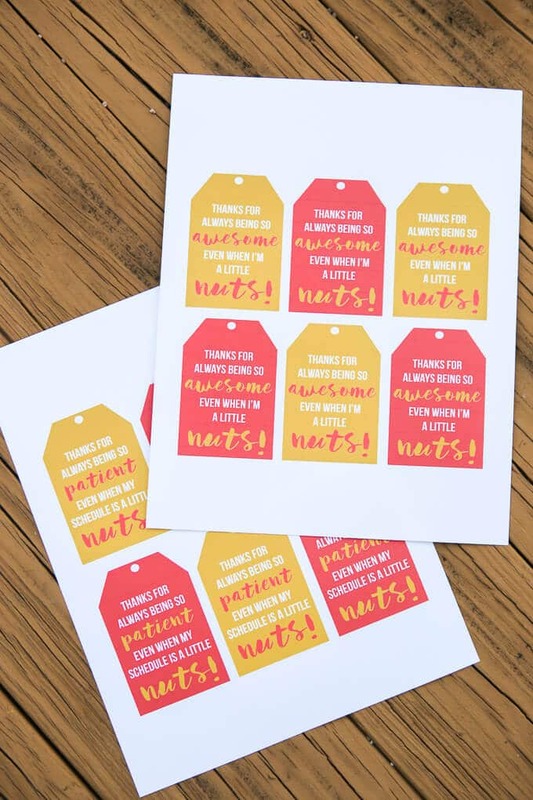 Tell someone you appreciate them with this simple thank you for being awesome gift idea including free printable you’re awesome gift tags and a coupon for TURTLES®! This year has been a roller coaster to say the least. 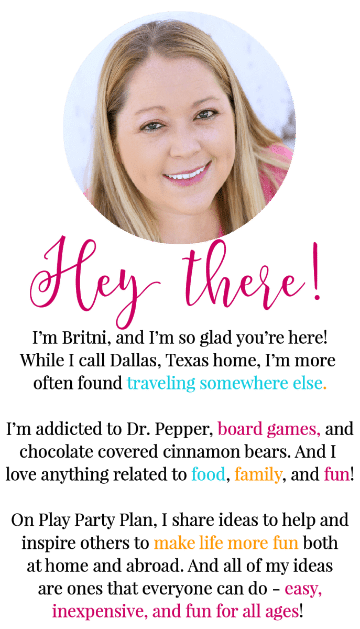 From amazing trips to Turks & Caicos and Alaska to dealing with PPD and trying to get a handle on having a two-year-old, I honestly never knew what the next week would bring. The one constant in the year was that no matter what I did, where I went, or what I looked like – that when I returned to church on Sunday, the 12 and 13 year old girls I teach each week would be excited to see me. And it’s amazing how much of a bright spot they’ve been in such an interesting year. They’ll probably never know how much of a different their smiles and hugs made, but I did. And I still do. Somehow any time I was nervous to go to an activity because I didn’t think I’d have any friends there, one of my girls would be there and come give me a big hug and tell me about their day. Or when I felt frumpy and out of sorts, one of them would tell me how they liked my skirt. They were a light in my life when I needed it, and I’ve been lucky to get to know them over the past year. I taught my girls one last time in 2015 this week and at the end of the lesson, I really wanted to do something nice for each of them as a way to say hey you’re awesome and I really appreciate you. I didn’t want to give them a Christmas present or a handout that really went with the lesson, I really wanted to give them something just because I appreciate all they’ve done for me. My husband and I brainstormed for a while to come up with some silly phrase (because that’s what I do) that would convey what I wanted to convey without being too cheesy. 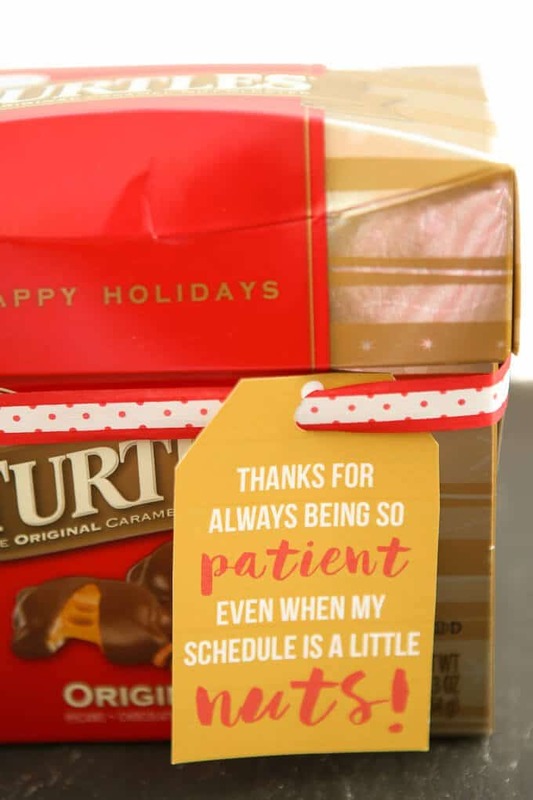 I saw DeMet’s TURTLES® in the candy aisle when I was picking up supplies for my Elf on the Shelf party and knew they would be perfect. Something a little bigger than K’s fun size candy bars from Halloween but not too big for them to think I was bribing them into liking me. And TURTLES® are my absolute favorite with their delicious mixture of chocolate, nuts, and caramel so I figured all of the girls would like them too. Happy girls = happy me. 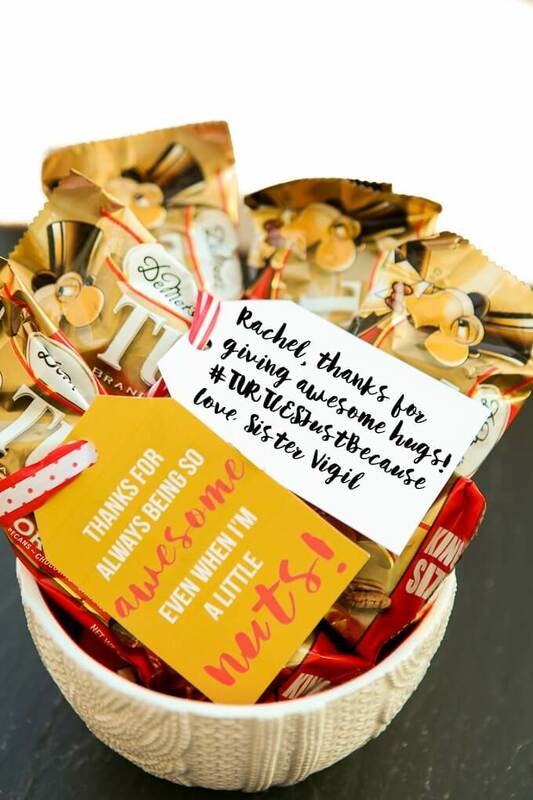 I picked up a bunch of the 3-piece bars for my girls and a TURTLES® gift box for the other leader that works with the girls for me and went home. 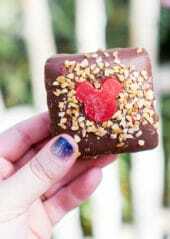 And then the fun began trying to come up with the perfect cheesy saying to go with the perfect treat. It took me a while but eventually this is what I came up with. 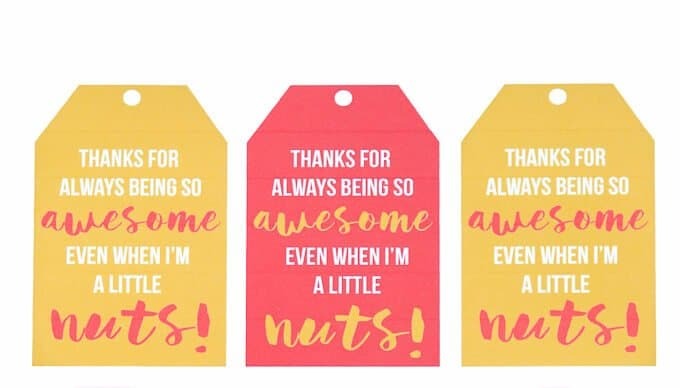 For my girls, “thanks for being awesome even when I’m a little nuts,” and for the other leader, “Thanks for being patient even when my schedule is a little nuts,” (because she has to cover for me a lot). It includes nuts, which is a key component of the TURTLES® and goes right along with my mental state of being and crazy lessons, and reminds the girls that I think they’re awesome. I made gift tags with the saying that match the TURTLES® branding colors so it wouldn’t seem too Christmasy and just tied the tags to the TURTLES® with some matching ribbon to keep things simple. 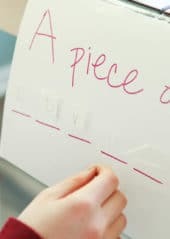 If you don’t have ribbon, you could also use something like baking twine or honestly just taping the tags directly onto the TURTLES® works just fine too. And on the back, I wrote a short little personalized note to each of the girls to let them know why I appreciate them personally. Want to spread the joy to someone in your own life just because you can? 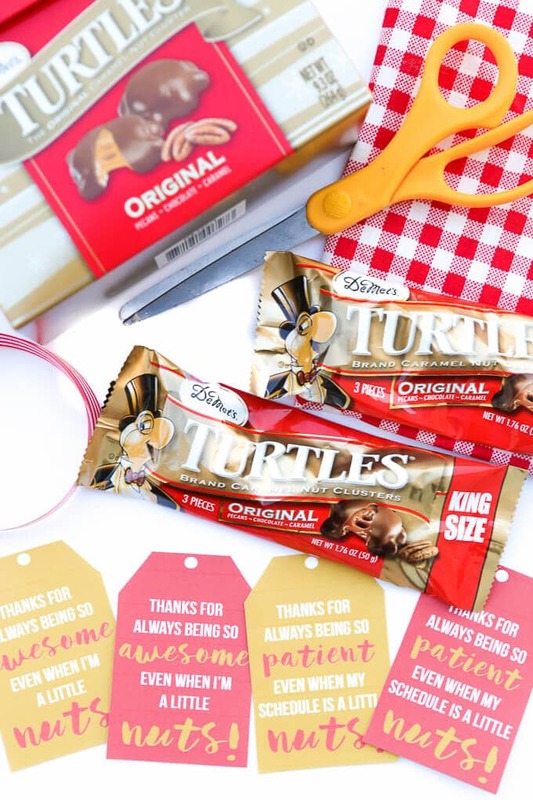 Use this coupon to save $1 on TURTLES® clusters Enter your first name and email address in the form below to get the printable. If the form isn’t showing up below, click here to get to the form to download the printable files. 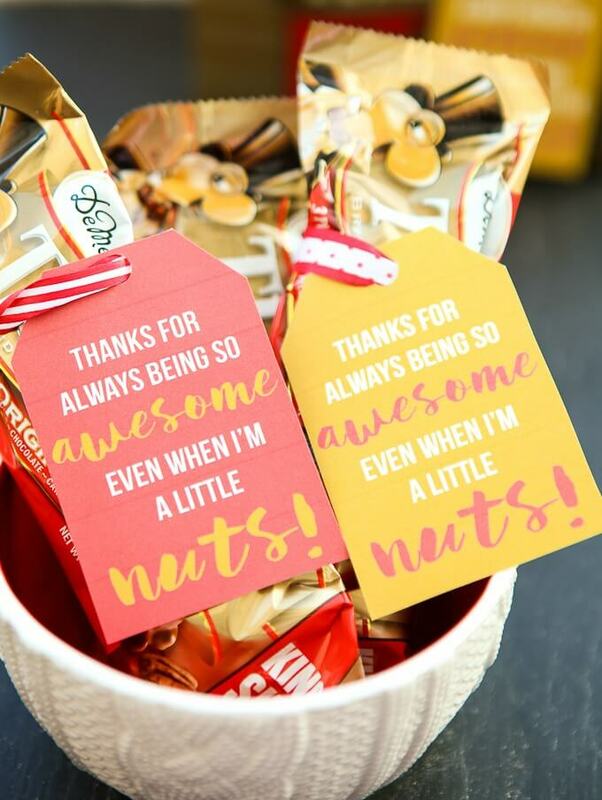 Then pass them out to the people you appreciate most. 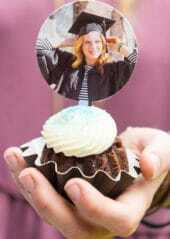 Want to see more great ways to use TURTLES®? Check out the TURTLES® community on Facebook.